Finally a bigger Dynafit race pack. As you could guess, the RC28 is 8 liters more voluminous than the RC20. 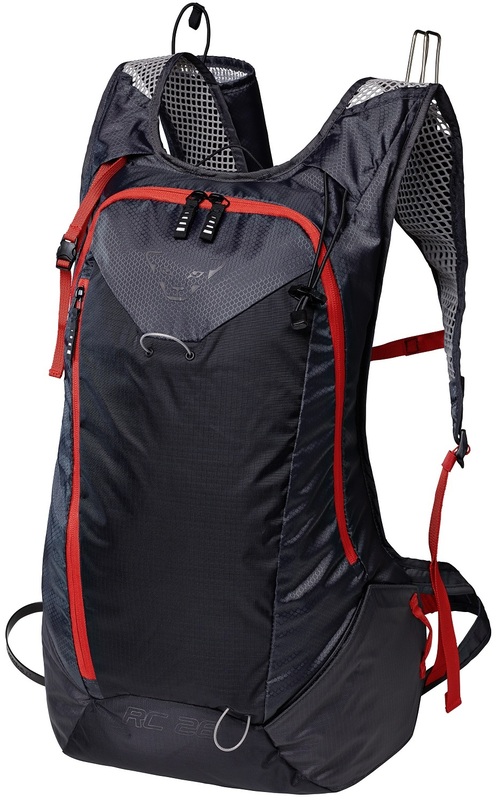 It shares the ultra-fast ski carry system, breathable mesh shoulder straps, and other features with its litter brother. But you can just put more in. Enough for the Grand Traverse? Someone will try. Until then, we can say it’s big enough for bigger days in the backcountry. Safety Box crampon compartment is side-accessible with a collapsible divider. Dedicated spots for your shovel, probe, and ice axe help keep things organized. Side-zip similar to the RC20 lets you dig in with it slung over one shoulder. Additional front zip encompasses the top and sides for big item placement. Bottle holder on the shoulder strap is lined with a thermally-reflective coating. Partner ski carry system lets you assist a slow or wounded companion. Zippered security pocket on the inside can hold sensitive valuables. What is the ski loop size? 130mm? Hey Mike, I tried a handful of different skis in the carry loop and 115mm was about the max of what you can comfortably fit in there. There was still a bit of room at 115mm so you could theoretically manage a slightly wider tail but it would get really tight! Any idea what the max shovel blade size and probe section length is in this pack? That would be very useful information for this and other race packs. Hey Carl, I just stuck an ARVA Plume in there and it fit reasonably well. I wouldn't go too much bigger than that though. Would be great to have a chart of max blade & handle sizes but not all measurements are equal. For example the CAMP Rocket blade fits in some slots that smaller blades don't because there is no protrusion for the handle.